I'm very excited about the forthcoming launch of 'Slí Bhríde' - Brigid's Way - a Celtic Pilgrimage route based on an alignment of prehistoric and eminent sites and monuments linking the two places most strongly associated with Brigid - the Saint and the Goddess - Faughart and Kildare. Earth showing the sites along the alignment. The new pilgrim route is inspired by an alignment which was initially discovered a decade ago when Richard Moore and I found that the Hill of Tara, the Hill of Slane and the Mount Oriel barrow cluster were perfectly aligned. We furthermore realised that, at the moment Saint Patrick lit the Paschal Fire, at dusk on March 26th 433AD, an incredible cosmic event was happening in the sky over Slane. 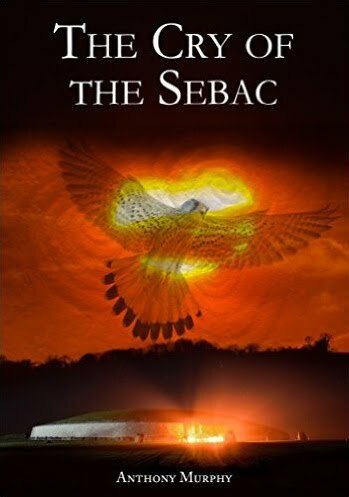 With the eyes of the High King, Laoghaire, and his subjects drawn from Tara towards Slane, Patrick lit a huge fire just as the cross-shaped constellation Cygnus was rising over Slane, with the centre star of the cross, today called Sadr, directly in line with the fire. The cosmic symbolism of that moment was incredible. The ancient and sacred cross of old Ireland, present in Newgrange and other prehistoric sites, was being replaced with a new cross, the cross of the new religion, brought from distant lands. But the alignment must have been prehistoric and pre-dated Patrick possibly by three millennia or more. The Hill of Tara is at least Bronze Age in date with one remaining monument, the Mound of the Hostages, probably dating from the Neolithic. The motte on the Hill of Slane is probably at least Bronze Age in origin, if in fact it was not merely refashioned by the Normans from the remains of a Stone Age passage-tomb. The barrows on Oriel are also likely to date from the Bronze Age. In 2008, I discovered something even more interesting. 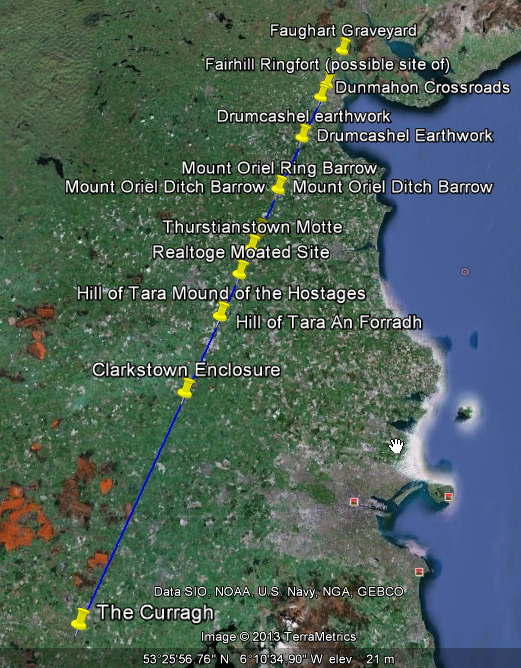 When you continue the line (in fact it is an arc, which follows the curvature of the earth) north and south, it leads to two places directly associated with Brigid - Faughart, her birthplace, and The Curragh in Kildare, where she grazed her cattle and beside which she established her monastery. 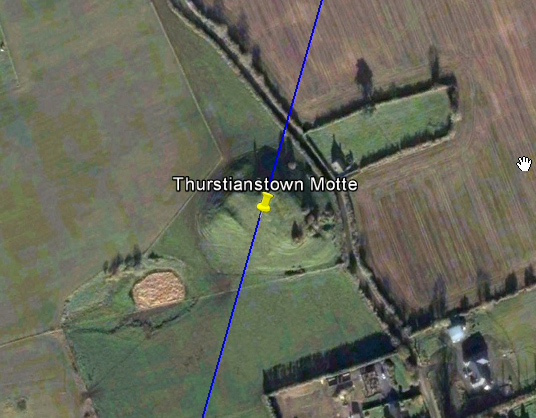 This discovery was detailed in the second edition of 'Island of the Setting Sun - In Search of Ireland's Ancient Astronomers', published in 2008.
including this motte at Thurstianstown, near Beauparc. The precision of the alignment is astonishing. A line from the sacred Well of Brigid on the hill of Faughart disects the barrows on Mount Oriel, passes directly through the motte on Slane, directly through the Rath of the Kings on Tara, and also neatly intersects a large motte at Thurstianstown (Beaparc, Co. Meath), and also a moated site on Réaltoge, a hill meaning "star". 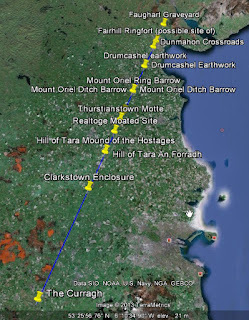 Now, Dolores Whelan and Karen Ward have been following that alignment, and have discovered that there once was a Slí Bhríde, a pilgrim route of Brigid, which probably ran from Faughart towards Kildare. They are launching a modern 'Slí Bhríde', celebrating Brigid in all her forms, since she was also a prehistoric goddess. This is very much a Celtic pilgrim route. The Slí Bhríde will be launched on Saturday, February 2nd, at 1.30pm in the Louth County Museum, Jocelyn Street, Dundalk, Co. Louth, by Dolores Whelan, Karen Ward, Anthony Murphy and Sally Cox. See more about the festival celebrating Brigid of Faughart at Imbolc on Dolores Whelan's website. I, Brigitta Witteveen, would like to walk this route. I am named after Saint Brigid. I would love to know what to do to be considered. Where would I start where would I stay along the way. Can I help with this project. I would love to be the first to walk it and find out what it needs. Brigitta, That's wonderful. The official website of the new pilgrimage is www.brigidsway.ie but it has not been launched just yet. That website will contain all the information about the route and the dates when it will be first walked etc. If you want to give me your email address I will forward your details on to Dolores and Karen to see if they could use your help. Thanks.